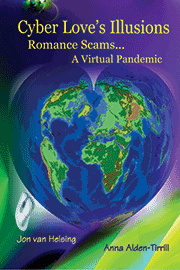 Cyber Love's Illusions: Romance Scams . . . A Virtual Pandemic . . . War on Romance Scam Fraud! Romance Scams . . .
Every year, West African Romance Scam Artists bilk innocent victims in the West and Far East for BILLIONS of Dollars. They do it by getting victims to think they have fallen in love with a mythical person. Once the Romance Scam Artists have won the trust of their victims, they either trick them into sending them money under a number of guises or get them to reship merchandise. These guises include multiple disasters that suddenly happen once they get involved with their victims. If the victim has no money, the Romance Scam Artist convinces the victim to cash fake financial instruments (checks, money orders, drafts, etc.) and wire (via Western Union or MoneyGram) them the money before the financial community can figure out the instruments are fake. Other times, the Romance Scam Artists use victims as "mules" to receive property they have bought with stolen credit card information, and reship the goods to them in West Africa and other locations. While these scams on their face look to be like any other confidence game, the International component changes the complexity of these crimes. Now, the Romance Scam Artists are nameless and faceless. They hide behind fake profiles on Internet Dating Sites, Social Networking Sites, Instant Messaging Systems, or even "Chat Rooms." Since they do not live in the same country as the victim, the police cannot cross International borders to apprehend the Romance Scam Artists. They must depend upon corrupt police officials in Third World Countries to do the right thing. Like in most scam situations, victims are not likely to get their money back. The most dangerous component in the West African Romance Scam world, however, is the false creation of counterfeit monetary value (the creation and successful passing of fake checks, money orders, drafts, etc.) by these Romance Scam Artists. This creation of fake value is no different than the counterfeiter who prints money off a printing press and then uses the counterfeit money to successfully purchase goods and services. If a country has too many counterfeiters creating false wealth in an economy, the targeted economy will suffer hyper-inflation and eventually collapse. In the end, the people cannot afford to buy the goods and services they need to survive. The people affected by this hyper-inflation will demand that the government do something. Throughout history, countries have responded to the problems of hyper-inflation by slowly adopting a centralized, dictatorial form of government in an attempt to protect its economy and way of life. High levels of inflation eventually destroy the country's economy and forces governments to respond by abandoning their republican and democratic forms of government. Ironically, when a nation defends its economy by adopting a centralized, dictatorial form of government in an attempt to control their economy, they play right into the hands of the very fascists, communists, and Islamic fundamentalists they pretend to deplore. When governments degenerate into these centralized models, their new form is not much different than the one favored by Islamic fundamentalists (especially like what we have seen in Iran since 1979), other fascist dictatorships (like Hitler, Franco and Mussolini) or in communist dictatorships (like Lenin, Stalin, Castro, Ho Chi Min, and Mao Tse Tung). When these dictatorial forms of government are adopted, personal freedoms are either heavily restricted or eliminated altogether. The authors have discovered that many Islamic Terror Organizations are working in West Africa and other locations in the world to undermine the economies of the West. By doing so, they are forcing their target countries to adopt dictatorial forms of government. Once these countries have done this, the terrrorists think it is easy for their organizations to undermine them and bring them under their control. The war on Romance Scams, therefore, it not just about fighting crime, it is also about preserving our way of life. The Cyber Love's Illusions trilogy is about preserving this freedom and making sure we have true representative government guiding the countries of the world. A sound financial system is the backbone of honest representative and limited government. Undermine the financial system and you undermine the government. When this happens, representative limited government is invariably replaced by dictatorial, centralized government. We saw it in Egypt, Babylon, Greece, Rome, and more recently, in the Weimar German Republic in the 1920s and 1930s before the country transformed into Nazi Germany. Now, we are watching the same thing happen here in the West!